That “Khayal” or “thought” of Gulzar sahab was always depicted with a serene voice on screen by a person called Kishore Kumar. The poetic impact of Kishore Kumar and Gulzar on the movies are everlasting and unforgettable. 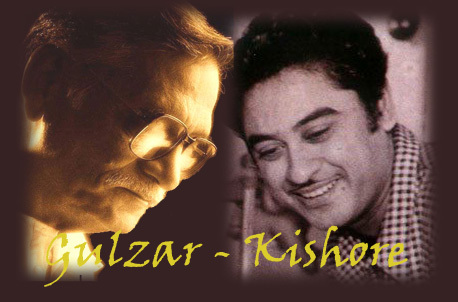 The deep voice of Kishore Kumar coupled with the words of Gulzar has always been special. Be it the music of Rahul Dev Burman, Salil Chowdhury, Hemant Kumar, Khayyam or Rajesh Roshan- the resultant output has been mesmerizing. Their association can be traced back to 1968, with Bimal Roy’s “Do Dooni Char”. Gulzar sahab’s thoughtful lyrics of “Hawaon pe likh do hawaon ke naam, hum anjaane pardesiyon ka salaam” coupled with Hemant Kumar’s melodious tune and an open throated soulful Kishore Kumar’s voice leaves a memorable song dedicated to the nature. The breezy, wild lap of Mother Nature was never been depicted in such a detailed way- “Yahan subah se khela karti hai shaam…”– how true! Makes you imagine a village road, twisted and turned, to take you to the bank of a river with green grass and huge shadows of trees. Sit alone on a boat at the dusk, and the first song which you would love to grasp is “Woh shaam kuchh ajeeb thi, yeh shaam bhi ajeeb hai, who kal bhi paas paas thi who aaj bhi kareeb hai”… Feels like taking a aloof ride on a boat on a still river and thinking and getting immersed in the beauty of the twilight with bygone thoughts enveloping your mind. Who did a better job? Gulzar with his pen, Hemant Kumar with his tune or Kishore with his vocals?? I would say, all of them. A symmetry between these three makes this song from “Khamoshi”(1969) one of the most beautiful soulful songs in Hindi films. Gulzar’s expression on life has mostly been indirect.. Be it grief, be it happiness, be it loneliness or be it appreciation on beauty, he is often indirect in expressing. But a direct expression by Gulzar could create hisory with “Koi hota jisko apna hum apna keh lete yaaron, paas nahi to door hi hota lekin koi mera apna”.. Compare this with other poetries on loneliness by this poet, you can feel there is that direct expression which makes this song plain and simple and everlasting. Gulzar had earlier worked with Salil Chowdhury for Anand, but this song of “Mere Apne” was special.. Special to many.. For Kishore, it was a ladder to prove his mastery of singing on a 12 maatra composition from the rhythmic master Salil Chowdhury… How wrong was Salil 17 years back on Kishore! Spellbound by the rendition and capability of Kishore, Salil lost no time to admit “he had underrated Kishore earlier”.. Gulzar’s direct lamentation on loneliness with words “Koi to gham apna tha, koi to saathi hota”, coupled with deep and heavy voice and sensational tune, this song is a landmark..
Rahul Dev Burman’s association with Kishore and Gulzar has always been special.. Be it the tune of a vagabond “Musafir hoon yaaron na ghar hai na theekana, mujhe chalta jaana hai, bas chalte jaana”.. Gulzar is never systematic.. His beauty lie in his thoughts breaking shackles of constraint.. His views had that “dhundlapan” or foggyness which no other poet could express with such confidence.. He could make a youth think in just an unthoughtful way and admit saying “Din ne haath thaam kar idhar bitha diya, raat ne ishaare se udhar bula liya…” – the only thing he can believe in his aimless life- the youth- is that only nature is with him and which is not changing.. Coupled with rhythmic tune of Rahul Dev Burman and the vocal of Kishore. This number of “Parichay”(1972) stands out in uniqueness. And what about the directionless beauty in “O Majhi re apna kinara”? A boatman has his understanding of the river, where to anchor and where to sail.. The person does not have.. A contradiction in approach if the river is the life and the person is the boatman.. He expresses it openly “Koi Kinara jo kinare se mile woh apna kinara hai”… This indirect approach of Gulzar on aloofness is what he is known for and what was expressed earlier. This song of “Khushboo”(1974) is again a gem. People say RD Burman broke down into tears after listening the final output on Kishore’s voice in the recording room.. Was it only for Kishore’s voice? Or was it because it was coupled with a poetry which could make people think that in all our lives , however systematic we may be, there comes a junction , where we feel “apna kinara nadiya ki dhara hai”..
“Jaane kya sochkar nahi guzra, ek pal raat bhar nahi guzra…” renders that isolation of Gulzar poetry, which he used to come back from time to time… The pain of the hours of aloofness again sewn in melodious notes by Rahul Dev Burman and vocal by Kishore, makes us feel, has there ever been a better narrator of aloofness than Gulzar?? A gentleman said once “Gulzar can never be imagined in a group photograph, Gulzar cladded in white, bespectacled, sporting a pair of brown chappals, standing and smiling alone”.. Perhaps, he is right. Kinara(1976) had other gems of Gulzar and Pancham and along with others, this special gift from Kishore’s voice is the most memorable. How can you express the aspirations and requirements of people belonging to the middle-class better than “Thoda hai thode ki zaroorat hai, zindagi fir bhi yahan khubsoorat hai”… ? Gulzar in simple words has just explained what the simplicity of middle-class is and what aspirations they have.. They dream but with constraint, they aspire but not detached from the ground… So when someone says “Main chhune zara aasmaan chali” , the other warns “Badal pe udna hoga…”. Khatta Meetha(1977). Composer:Rajesh Roshan. The isolation depiction takes a new turn with “Hazaar rahein mud ke dekhi kahi se koi sada na aayi….” This time Kishore and Gulzar teams up with Khayyam- the ghazal master. Both isolated beings want to reunion again, but something, some ego or some hindrance is again creeping in their minds and they are unsure who should approach whom and finally says “Tumhe yeh zid thi ke hum bulaate, humein yeh umeed who pukaare../ Hai naam hothon pe ab bhi lekin, awaaz mein pad gayi dararein..” This indirect expression is a signature of Gulzar always. The last two songs with which one can conclude this wonderful journey of these two talented artists. 1. Aanewala pal jaanewala hai..
2. Raahon pe rehte hai yaadon pe basar karte hai.. Both coming again from the tunes of Rahul Dev Burman, the first one makes you feel the importance of every passing moments in life and the other takes you to a ride of time where the person does not bother where the time is going, but only to bother how much road is traversed. Contradictions? But then, Gulzar is all about poetry which defies all norms and all shackles of tradition..
6. Tum aa gaye ho. The last three songs of “Aandhi” need a special mention here, as it is not only Gulzar-Kishore, but Lata Mangeshkar beautifully teaming up, and Pancham indeed! While “Tum aa gaye ho..” is a simple rendition of love, “Tere bina zindagi se shikwa..” is perhaps the most sensitive duet from the golden age of music. Lata carries off the first two stanza with soft and soothing touch and Kishore enters late with the heavy impact rendering “Tum jo keh do to aaj ki raat chand doobega nahi”.. A complex relation, broken long back but united temporarily knowing very well it is will break again, how desirous the man sounds in that line where he wants to stop the time so that the momentary accompanying does not get lost. Just as I had started with the thoughts of Gulzar, I end with a nostalgic feeling and that tenderness in poetry and rendition, which makes Gulzar and Kishore so special..
Ek door se aati hai, paas aake palat ti hai.. They move on but always seems in their movements, the time has come to a standstill. This entry was posted on Wednesday, August 4th, 2010 at 1:22 pm	and is filed under Specials. You can follow any responses to this entry through the RSS 2.0 feed. You can skip to the end and leave a response. Pinging is currently not allowed. Lovely expressions indeed. Very Nice. Alway been a fan of the trio, never could express the real thought. All time Great combination. The combo had given excellent output. More than 90% songs were popular and though provoking. Guljar’s poetry sounded tremendous in Kishore da’s vocals. Never before and never in future. Thanks for recollection of nostalgic memories of yesterdecades. Congrats for the wonderful article. What a power and what a voice. JAI HO KISHORE DA. You will live ever as long as the World Exists. Till now no body has reached anywhere near your voice and power. Absolute clarity and perfection. why have u left “sapne mein dekha sapna”.i think its the most intelligently written comedy song & sung & even picturised great. The deep sonorous voice of Kishore Kumar is music connosieur’s delight. A versatile singer like Kishore is born once in decades. I simply love sons sung by him. I know 2 persons who were immensely benefited by the Kishore DA’s voice , yet do not want to acknowledge his contribution. One is S.P.Bala Subramanyam. This gentleman imitated Kishore Da in his early days and got popularity as a singer. He has even acted in a telugu version of PADOSAN in the role Kishore played in Hindi version, and imitated his acting as well. He do not want to utter the name of Kishore Kumar also. Reasons, he must be knowing. The other gentleman is Amitabh Bachan. Almost all the popular songs of this actor more than 90% were sung by Kishore Da. He had great admiration for Mohd.Rafi, which nobody can object. He has to acknowledge in a befitting proportion about the contribution of Kishore Da’s voice for his success. Unfortunately, for this tall great actor, Kishore da never “Yaad Ayaa”, but he sang a song stating that “………. tum bahot yaad araha hai”…. It is pity on their part. i don’t follow. what are you referring to? the song with sunny deol and sanjay dutt in the audience sang by mohd. aziz? i had no idea that spb played kishore’s role in padosan. really interesting trivia! i agree…kishore made immense contributions to amitabh’s career. I was referring to a song sung by Mr. Amitabh Bachan, after demise of Mohd. Rafi sab, it starts like that “Mohd.Rafi tum bahot yaad aa raha hai”. I was dis-satisfied, he never bother to acknowledge kishore’s contribution for his success, in any proportion. It is Amitabh Bachchan’s pure personal wish whether he wants to acknowledge Kishore’s contribution or not. Kishore might not necessarily be his favourite singer only because he sang more than 200 songs for him. Sometimes we take things on their face values. Neil Nitin Mukesh- the grandson of the great Mukesh- openly declares Kishore as his most favourite singer and not his grandfather even though he is earning fame on his grandfather’s pseudo-name(Mukesh) and not on the actual surname(Mathur). Biswajeet and Mehmood- two actors who gave maximum lips of their songs to Rafi, used to sing praises of Kishore every now and then. The voice of wheelchair ridden Mehmood singing ‘Ruk jana nahi tu kahi haar ke’ on a TV show in mid-90s as his most favourite song still echoes in my ears. At the end of the day, it is an individual’s choice. Thank you for your comments. I was not referring to the personal likings and dislikings of individuals. It is the gratitude one should have for another person who contributed for his upliftment. I am a great fan of Kishore Da and at the same time, but never dislike Mohd.Rafi. I also enjoy Rafi’s songs very much. What I mean to say is Amitabh is discourteous towards Kishore Da who has made wonderful contribution for Amitabh’s success. The another gentleman SP Bala Subramaniam. He has dual stands. When he is singing in different languages, it was O.K. for him and people have to admire him. When singers like Udit Narayan, Shreya Ghoshal, Kumar Sanu of this generation sings in Telugu and other souther languages, he tooks severe objection about their diction, pronunciation and other silly things. In the early days of SPB as singler, it was Super Star Krishna who nurtured him and gave him ample chances for singing, unmindful of Ghantasala and PB Srinivas who were much sought after those days. The same gentle SPB stopped singing for Krishna in later years. aap ke gane ka andaz ko me salam karta hnu. Kishore Kumar was a genious singer. No one can fill his gap. Great and well-written article. Gulzar happens to be my favorite Hindi film lyricist as well as Indian poet and Kishore Kumar is of course, my favorite singer. One thing I will say is that for all the great songs you have mentioned, two more are worth mentioning that many people never got to hear. One is Kaise Dekhun Meri Aankhon Ke Bahut Paas Ho Tum from the unreleased film Bharosa. This wonderful duet by Kishore Kumar and Lata Mangeshkar is as good if not better than all of of Kishore Kumar’s songs for Gulzar. A major reason for that is that the music is once again by R.D. Burman, who, as you wonderfully pointed out, always made masterpieces with Gulzar as well as Kishore Kumar. Both these songs deserve a mention when talking about Kishore Kumar and Gulzar as I’m sure they would have been as popular as the songs of Aandhi, Kinara, Khusbhoo, etc if the respective films in which the songs would have featured had been released. I do not think amitabh’s personally liked mohd rafi. his home production amitabh is a testimony for it. amitabh was at asuch a position after 1978 that he could have dictated to use voice of rafi . he did not do it. rather he came on a radio program and praised songs of yaarana! his answer was koi kisiki chutti nahi karata . ye kahana or scohana galat hai. sab aone hagah pe sahi hai. kishorekuymar to mere gane ki prerana hai. maine unke abhinit movie padiosan ki remake me kam kiya hai. Kishore kumar was a very popular singer with a good fan following which continues. He had his own great contribution to bollywood film world, but neverthless on overall range, if one looks at all genres, like classical, ghazals, high pitch songs, rafi had a edge over kishore kumar, not to criticise kishore, but to say that rafi was gifted singer in these genres, which kishore had not contributed much. But, however, one needs to agree that in the 70’s the kishore type of singing was preferred, which was a change, and kishore had a rise and which continued almost parallel with rafi until the end. I feel the main difference between both the singers is that rafi was more classically trained than kishore which made rafi more preferable by music directors specially who had more inclination towards composing songs in the traditional and classical style, which had its lot of influence in the 50’s and 60’s in hindi cinema. One will not find such environment in 70’s songs, even for rafi songs as compared to his earlier 50’s and 60’s songs, as the change brought out by kishore kumar was evident and rafi too had to contribute to that in synchronisation with the music directors of the 70’s. Another singer along with these two was manna dey, who sailed through the 60’s and 70’s who incidentally had a classical edge and who was looked upon more for pure classical compositions. Such a lovely words to express kishoreda, Gulzar, Panchamda & others. I can’t resist to post a comment for the expressions mentioned in word. A man who had no basic training in classical music, Kishore da, it is learnt, had no passion for playback singing. On the contrary, his aim was to make it big on the silver screen as an actor on the lines of his elder brother Dada Muni (Ashok Kumar). A humble Kishore da was very reluctant to sing “Waada Tera Waada” in Dushman and suggested Laxmikant Pyarelal to get it sung by Rafi. But LP and Kaka (Rajesh Khanna, the hero of the film) stuck to their guns and got him to sing the song. Man, what a number. Don’t think Rafi would have been better though “if one looks at all genres, like classical, ghazals, high pitch songs, rafi had a edge over kishore kumar.” Let’s us not compare. Appreciate wholeheartedly a legend called Kishore Kumar — his versatility, his talent, his humour — he still rules Bollywood music (take a look, don’t listen, at all the remixes) even 25 years after his death. The void created by the legendary singer will never be filled. Who can forget those lilting numbers dished out by him – ‘Chingari koi bhadke’, ‘O mere dil ke chain’, ‘Jai-jai Shiv Shankar’, ‘Pal-Pal dil ke paas’ ‘Ye jeevan hai’, Bhool gaya sab kuchch’, ‘Woh shaam kuchch ajeeb thi’, ‘Dil aisa kisis ne mera toda’ ‘O manjhi re…and thousands more. Totally agree Gulzar Kishore combination gave us some outstanding songs. and Kishore did develope into a great singer. no playback singer be it a male or female had and will ever have the verstality of Rafisaheb. He had his short comings. but versatality he beats everybody hands down. main kishore da, gulzar sahab and r.d.burman ka bahut hi bada fan hu , aur in teeno ka cobination mujhe bahut hi achcha lagta hai , kishore da ke gaaye hue total songa amar hai unki voice kaano main jaise amrit gholti haiunaki voice sunkar ek adbhut shanti milti hai aur mai gulzar sahab ka bhi bahut bada fan hu. burman da ka to koi zawab nahi unaki dhune mujhe bahut hi achchi lagti hai unaki dhune auro se diffrent hai. Kishore was an amazing talent one that I doubt would ever come again…..His immense knowledge of Music inspite of being not trained needs much appreciation……RD Burman once said that Kishore use to Improvise a lot & would add lot of value to a song….which no other singer could do……Kishore always wanted to become a singer & never an actor……It is wrongly stated above by my dear friends that Kishore wanted to become an actor like his elder brother…..
Rafi and Kishore both are the best playback singers in India; no body can replace them. Please don’t compare them. Playback singing is an acting of the actor where nobody can compare Kishoe and for real trained singer’ touch with melody, nobody can compare with Rafi. It is also true this generation loves Kishore more though he died more than 25 years before. If you hear radio(FM), you will hear more of Kishore’s and selling of records here again Kishore will dominate. Still as a singer (considering Classical, training etc), Rafi should be voted the best but we like to hear more of Kishore’s because the voice gives us maximum entertainment. Ek bar sony tv me sankar ehesan loy aye the unko jab pucha gaya k favourite singer between rafi sahab&kishore da.they all says we know rafi sab is great but when kishore da gata hay to dil ko choon jata hay..
or jo gana dil ko sakun deta hay wo gana kishorda ka hota hay. Kishore da is the greatest.